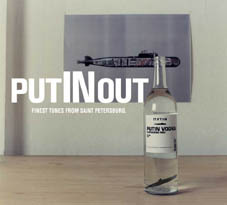 Finest Tunes from Saint Petersburg. across Russia, breaks with his schedule and puts in an extended layover in Saint Petersburg. Saint Petersburg has always been considered the vanguard of innovative music productions and the home of Russia's booming music scene. In a joint venture with Interactive, the city's most important record shop, Jelinek visits numerous recording studios in turn, compiling sounds and tunes particular to Saint Petersburg. The twelve tracks selected for the CD include cuts by recognized Russian acts like HipHop maestro DJ 108, the producer called KLEY and the Drum & Bass wizards PCP. All free of commercial contamination, the definitive introduction to the post-Leningrad scene, these tunes range widely from jazzy Abstract Beats and mellow Drum & Bass to dancefloor Electro and HipHip. To protest the Putin regime's most recent abuses of power, and in the face of the music scene's political powerlessness, the CD's cover is designed at least ironically to show up Russia's present collective discontent. Na zdorovie!